Come celebrate the pleasant pubs and country clubs dotting the rolling hills of the English countryside across the sea! 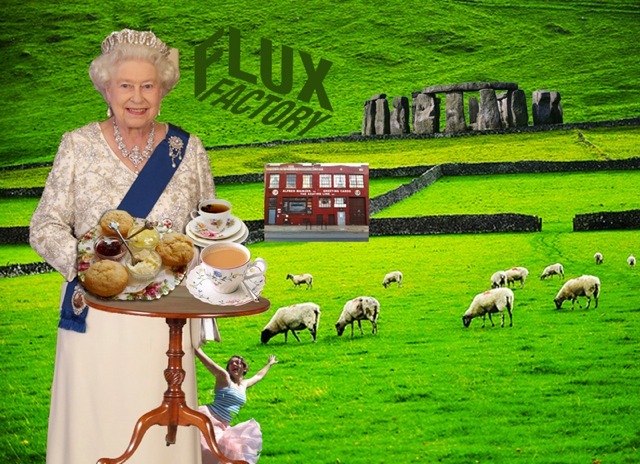 Delicious beverages, sky-high croquet, a Make-Your-Own-Crown Station, lush greenery, sheep, and appearances by the Queen await you at the Flux Factory. Come early for crumpets and tea, and stay for hot thrash and dancey British tunes. This is Phase 1 the Flux Factory – Islington Mill Exchange. Saturday, August 13 · 12:00pm - 3:00pm Gowanus Studio Space, 166 7th street, Brooklyn Boatbuilding collective Mare Liberum will host a make-your-own kayake workshop.